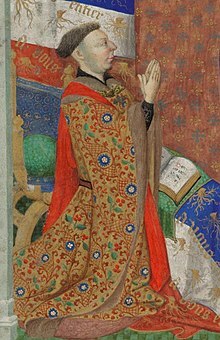 John of Lancaster, 1st Duke of Bedford KG (20 June 1389 – 14 September 1435) was a medieval English prince, general and statesman who commanded England's armies in France during a critical phase of the Hundred Years' War. Bedford was the third son of King Henry IV of England, brother to Henry V, and acted as regent of France for his nephew Henry VI. Despite his military and administrative talent, the situation in France had severely deteriorated by the time of his death. Bedford was a capable administrator and soldier, and his effective management of the war brought the English to the height of their power in France. However, difficulties mounted after the arrival of Joan of Arc, and his efforts were further thwarted by political divisions at home and the waverings of England's key ally, the duchy of Burgundy. In the last years of Bedford's life, the conflict devolved into a war of attrition, and he became increasingly unable to gather the necessary funds to prosecute the conflict. Bedford died during the congress of Arras in 1435, just as Burgundy was preparing to abandon the English cause and conclude a separate peace with Charles VII of France. After his father's accession to the throne of England as Henry IV in 1399, John of Lancaster began to accumulate lands and lucrative offices. He was knighted on 12 October 1399 at his father's coronation and made a Knight of the Garter by 1402. Between 1403 and 1405 grants of the forfeited lands from the House of Percy and of the alien priory of Ogbourne, Wiltshire, considerably increased his income. He was appointed master of the mews and falcons in 1402, Constable of England in 1403 and Warden of the East March from 1403 to 1414. He was created Earl of Kendal, Earl of Richmond and Duke of Bedford in 1414 by his brother, King Henry V.
When Henry V died in 1422, Bedford vied with his younger brother, Humphrey, Duke of Gloucester, for control of the Kingdom. Bedford was declared regent but focused on the ongoing war in France, while during his absence Gloucester acted as Lord Protector of England. Bedford defeated the French several times, most notably at the Battle of Verneuil, until the arrival of Joan of Arc rallied the opposition. Bedford handed Joan to an ecclesiastical court, which had her tried and executed at Rouen in 1431, though Bedford himself took no part in the trial. He then arranged a coronation for the young Henry VI at Paris. Bedford had been Governor in Normandy between 1422–1432 where the University of Caen was founded under his auspices. He was an extremely important commissioner of illuminated manuscripts, both from Paris (from the Bedford Master and his workshop) and England. The three most important surviving manuscripts of his are the Bedford Hours (British Library Ms Add 18850) and the Salisbury Breviary (Paris BnF Ms Lat. 17294), which were both made in Paris, and the Bedford Psalter and Hours of about 1420–23, which is English (BL Ms Add 42131). This last is signed in two places by Herman Scheere. All are lavishly decorated and famous examples of the style of the period. John's first marriage was to Anne of Burgundy (d.1432), daughter of John the Fearless on 13 May 1423 in Troyes,[a] The couple were happily married, despite being childless. Anne died of the plague in Paris in 1432. John's second marriage was to Jacquetta of Luxembourg, on 22 April 1433 at Thérouanne in northern France. This marriage was also childless, though Jacquetta went on to have more than a dozen children in her second marriage to Richard Woodville, 1st Earl Rivers. In addition, out of wedlock he had a daughter named Mary, who married Pierre de Montferrand (d. 1454), son of Bertrand de Montferrand, and had issue; and a son, Richard. John died in 1435 during the Congress of Arras at his Castle of Joyeux Repos in Rouen, and was buried at Rouen Cathedral near Henry the Young King, but his grave was destroyed by the Calvinists in 1562. Today a plaque marks the former location of his grave. He had no legitimate surviving issue. He appears in William Shakespeare's plays Henry IV, Part 1 and Henry IV, Part 2 as John of Lancaster, and in Henry V and Henry VI, Part 1 as Duke of Bedford. Georgette Heyer's novel My Lord John deals with his life from when he was four to about twenty. In the 2011 Philippa Gregory novel, The Lady of the Rivers, John features as the first husband of main character, Jacquetta of Luxembourg. As a son of the sovereign, John bore the Royal arms of his father King Henry IV, differenced by a label of five points per pale ermine and France. In the Bedford Book of Hours these arms are shown supported by an eagle collared with a crown and a sable yale all on a gold field sewn with gold "wood stocks" (cut tree stumps with roots), a heraldic badge of King Edward III, referring to Woodstock Palace. It is possible that the yale was painted in silver which has tarnished black. The shield is surrounded with a pair of banners gules which reverse in argent with the motto repeated four times: A vous entier (To you / yours entire[ly]). This may be a pun on the German Tier, i.e., beast, or on (English) tears —or 'tiers' of meaning, including tierce, referring to himself as third in line to his father's throne and by now rightful king but for the baby Henry VI. The Hours were supposedly produced as a courtship present from John to his wife, Anne, daughter of John the Fearless of Burgundy. There is a Queen's Arms public house sign from Birmingham which uses these supporters reversed and with an argent yale uncollared on a shield showing the English royal arms at left and to the right six divisions representing Lorraine. John's second wife, Jacquetta of Luxembourg, cousin to the Emperor (the King of Hungary), was mother to Elizabeth Woodville who may be this queen. Elizabeth Woodville's right to inherit these armorial supporters would seem dubious if they belong to her mother's first husband or to his first wife. Alternatively, though equally incorrect, the arms may be her mother's used in a flattering conceit. ^ Several authoritative sources are cited by the Library of Congress Name Authority File. Chevalier (1877–1903) states the marriage took place on 13 April 1423, but more recent sources agree on 13 May 1423 and one of those states Troyes (Library of Congress staff 2014). ^ "John Plantagenet, duke of Bedford". Encyclopædia Britannica. 27 May 1999. ^ Hunt 1892, p. 427. ^ Chisholm 1911, p. 616. Chisholm, Hugh, ed. (1911). "Bedford, Earls and Dukes of" . Encyclopædia Britannica. 3 (11th ed.). Cambridge University Press. pp. 616–617. Hunt, William (1892). "John of Lancaster" . In Lee, Sidney (ed.). Dictionary of National Biography. 29. London: Smith, Elder & Co.
Library of Congress staff (16 December 2014) . "Anne, of Burgundy, Duchess of Bedford, 1404?–1432". Smith, J.C. (1984). "The Tomb of Anne of Burgundy, Duchess of Bedford, in the Musée du Louvre". Gesta. 23 (1): 39–50. doi:10.2307/766962. JSTOR 766962. Stratford, J. (22 September 2011). "John, duke of Bedford (1389–1435)". Oxford Dictionary of National Biography (online). Oxford University Press. doi:10.1093/ref:odnb/14844. Allmand, C. (1983). Lancastrian Normandy, 1415–1450: The History of a Medieval Occupation. Clarendon Press. ISBN 978-0-19-822642-0. Brougham, Henry (1855). History of England and France under the House of Lancaster (2nd ed.). London: John Murray. LCCN 26005961. Burne, A. (2014). The Agincourt War. London: Frontline Books. ISBN 978-1-84832-765-8. Carpenter, C. (1997). The Wars of the Roses: Politics and the constitution in England, c.1437–1509. Cambridge University Press. ISBN 978-0-521-31874-7. Chrimes, S.B. (1929). "John, first duke of Bedford; his work and policy in England, 1389–1435". Bulletin of the Institute of Historical Research. 7 (20): 110–113. doi:10.1111/j.1468-2281.1929.tb00551.x. Cokayne, G. & Gibbs, V., eds. (1912). The Complete Peerage. 2 (2nd ed.). London: St. Catherine Press. Archived. Curry, A. (19 June 2012). "John, duke of Bedford's arrangements for the defence of Normandy in October 1434" (PDF). Annales de Normandie. 62 (2): 235–251 (1–17 in PDF). doi:10.3917/annor.622.0235. ISBN 978-2-902239-28-3. Evans, Michael R. (1992). "Brigandage and Resistance in Lancastrian Normandy: A Study of the Remission Evidence" (PDF). Reading Medieval Studies. 18: 103–134. ISSN 0950-3129. Keen, M. (20 November 2003). England in the Later Middle Ages (2nd ed.). Routledge. ISBN 978-0-415-27293-3. Lobanov, Aleksandr (1 April 2015). "The Indenture of Philip the Good, Duke of Burgundy, of 12 February 1430 and the Lancastrian Kingdom of France". The English Historical Review. 130 (543): 302–317. doi:10.1093/ehr/cev044. Lobanov, Aleksandr (2016). "The Treaty of Amiens (1423): Towards a Reconsideration" (PDF). Proslogion. 14: 244–263. ISSN 2500-0926. Moore, Terence R. (1982). The Hundred Years War during the reign of Henry VI: The English defeat—Its causes and impact (PDF) (Thesis). Department of History of McGill University. Myers, A. (1960). "A Vous Entier: John of Lancaster, 1389–1435". History Today. Vol. 10 no. 7. Neillands, R. (8 November 2001). The Hundred Years War (revised ed.). Routledge. ISBN 978-0-415-26131-9. Powicke, F.M. (1996). E. B. Pryde; D. E. Greenway; S. Porter; I. Roy (eds.). Handbook of British Chronology. Royal Historical Society Guides and Handbooks (revised 3rd ed.). Cambridge University Press. ISBN 978-0-521-56350-5. Pulling, F.S. (1910). "Bedford, John, Duke of". In Sidney Low & F.S. Pulling (eds.). The Dictionary of English History. London: Cassell. Rollason, Lynda (15 December 2015). "Bedford, John of Lancaster, duke of (1389–1435)". In John Cannon; Robert Crowcroft (eds.). The Oxford Companion to British History. Oxford Companions (2nd ed.). Oxford University Press. pp. 88. ISBN 978-0-19-967783-2. Sprey, Ilicia J. (2002). "John, Duke of Bedford (1389–1435)". In R. Fritze; William B. Robison (eds.). Historical Dictionary of Late Medieval England, 1272–1485. Greenwood Press. pp. 291–293. ISBN 978-0-313-29124-1. Stratford, Jenny (1993). The Bedford Inventories: The Worldly Goods of John, Duke of Bedford, Regent of France, 1389–1435. Reports of the Research Committee of the Society of Antiquaries of London. 49. ISBN 978-0-85431-261-0. ISSN 0953-7163. OCLC 29900611. Stubbs, W. (1880). The Constitutional History of England. 3. Oxford: Clarendon Press. Thompson, J. (1960). Economic and social history of Europe in the later Middle Ages (1300–1530). New York: Frederick Ungar Publishing. Williams, E.C. (1963). My Lord of Bedford, 1389–1435. Longmans. OCLC 2376051. "Biography of Bedford, duke of". Archontology. Lundy, Darryl (ed.). "John of Lancaster, Duke of Bedford". The Peerage. This page was last edited on 15 April 2019, at 01:51 (UTC).